Medieval life in Spain differed considerably from that in the other European countries. The vast number of Moors, Jews, Moorish-Christians, and other mixtures, plus the culture of these groups, constituted a fundamental point of difference. The eight centuries of the reconquest, from which emerged many aspects of the social, economic, and political organism added further to this distinction. Feudalism, that is, the set contractual arrangement between lord and vassal embodying the duties of each, was never as deeply rooted nor as widespread in the peninsula as it was elsewhere in Europe. A civilization constantly on the move, expanding, fighting, accumulating through victory in battle, retrenching, consolidating, was not likely to settle back and accept the rigid class divisions of the feudal order. 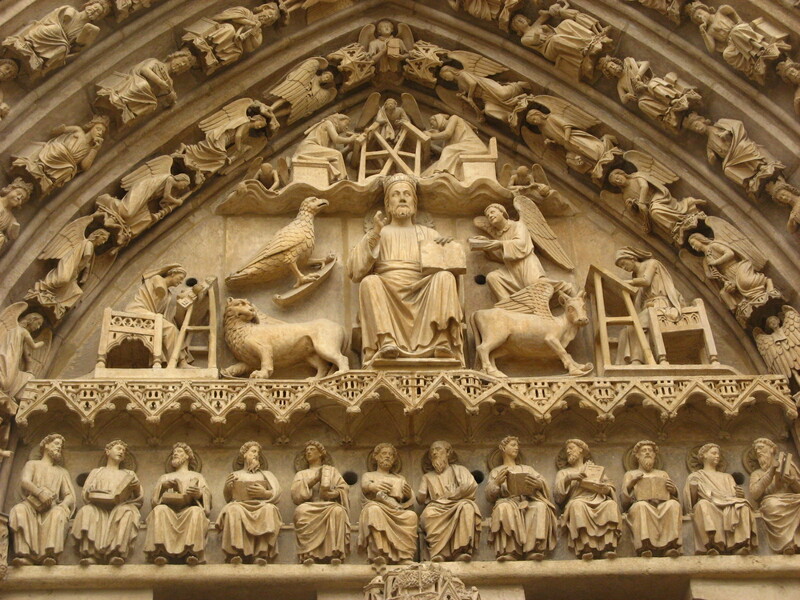 Architecture became the great art of these two centuries of the late Middle Ages. 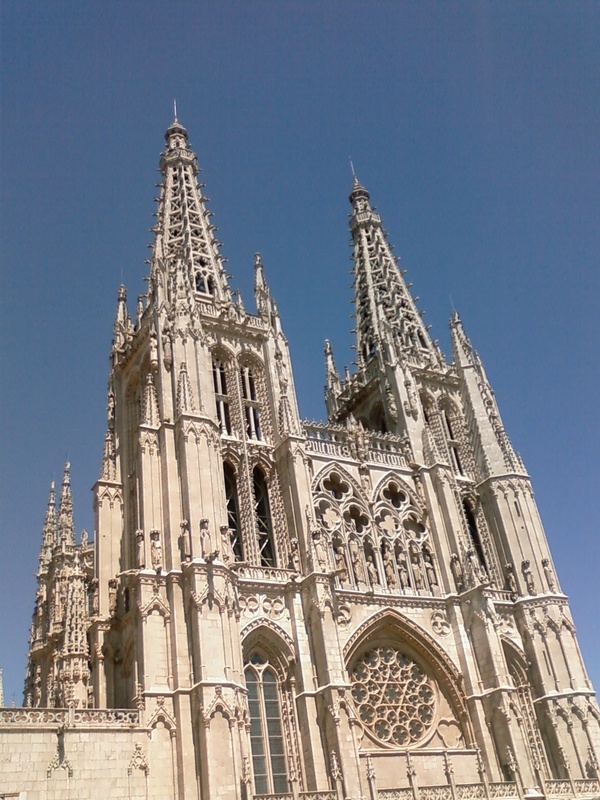 The magnificent cathedrals of Toledo, Burgos, Seville, León, and scores of other public and religious buildings were constructed throughout the land. The church became the mother of architecture and the stepmother of art. The cathedrals of Spain leave in one’s mind two very strong general impressions: first, they are not seen to best advantage from the outside. They are eaten up, as it were, by the cluttered stone buildings that surround and crowd them. They do not even occupy the best topographic locations, for example, the highest point in the city. They rise like great carved rocks from the hard, harsh, rocky land that gave them being. There is no sweep or proper perspective to their exterior view, but when one steps inside the impression immediately changes. It is a world of glorious fusion of many styles and cultures. It is a world of gravity, nobility, and faith of epic proportions. Nowhere can one better observe the successive moments of the exterior gravity and restraint of Spanish character out of which has blossomed the interior wealth and dignity of the Spanish spirit. 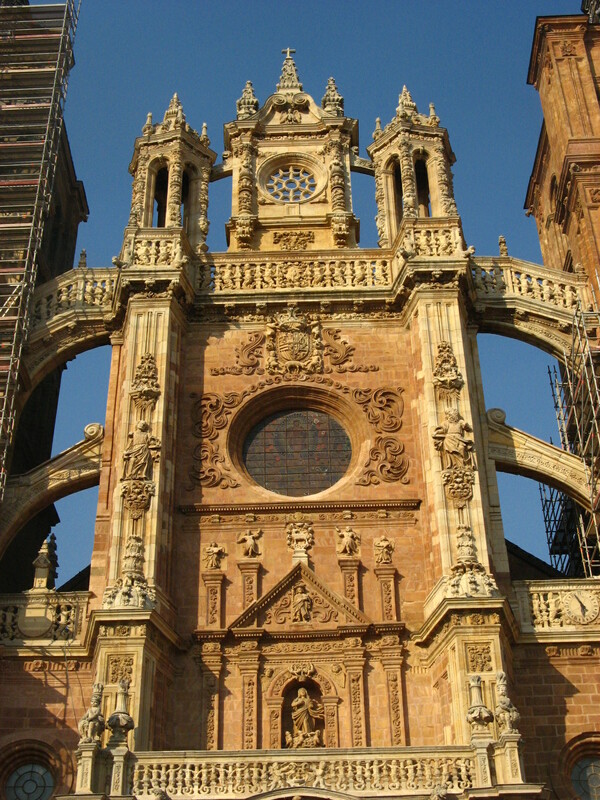 These great Spanish cathedrals, and countless other beautiful monasteries, refuge, and churches which accompanied them, symbolized the emerging religious unity of Spain, a unity which eventually would impose itself on the political and social organism. By 1300 the psychology of the Spanish Christian had reached a point where many began to look down on the Moors, who worked with their hands, and on the Jews, who were always counting money and accumulating luxurious things. The Spanish Christian had expressed himself in quite a different manner. His recaptured dwelling place, his courage in battle, his poverty in material things, his lordly gravity and insatiate longing for seigniory and dominion, his thrust of the entire self in a pure drive forward–these were all qualities which characterized his nation. The Spanish Jew between the years 1000-1400 was not the persecuted Hebrew of the Visigoth monarchy. Accepted by the Moors as an integral part of the Arabic culture of the peninsula, he was later accepted in the same manner by the kings of Spanish Christendom. They had come to depend on them in medical, economic and financial matters. Not only were the Jews tax collectors (which caused the populace to hate them), but they were also financiers, bankers, artisans of many kinds, physicians, and scholars. But Castile had forged its soul on a bleak, raw land against every adversity; hence respect for material things, the accumulation of them, and the working for them, held no grip on Castilian character. However, who can say that envy played no part in this picture, for it is natural that any man who has nothing should look with envy on the possessions of another. Add to this the religious element, and the racial ideal (purity of blood was a Jewish concept long before it was Spanish), and we have the makings of the Inquisition and the later persecutions. Until the late Middle Ages, then, Jews and Moors were accepted as an integral and indispensable element of Castilian life. When this “Castilian” life became Spanish, it was through the fusion of all these cultures in a single alloy, the Hispanic. In this manner did Spain emerge from medieval times into modern history. The Jews were among the finest writers in Spain during the Middle Ages. The earliest poems in the Spanish language are in Hebrew characters, and go back to the tenth century. The Jewish population of Spain continued to develop a rich and intense body of poetry in its own Spanish-Jewish dialect, including a whole corpus of wonderful ballads or romances. Many of these poems have a sharp and haunting lyrical quality. From this period on, balladry in Spain was a flourishing field. No one knows who composed the immense majority of the ancient ballads; they were preserved mainly through the oral tradition, and were not collected until around 1500. They were originally meant to be sung and danced by the people. It is a fascinating fact of Spanish literature that when the Jews were exiled from Spain in 1492 they carried hundreds of these ancient ballads along with them, and so deep was their love for Spain that many of them have survived in Sephardic communities all over the world. The Castilian villagers, in the first generations, were primarily warriors and shepherds; warriors because of necessity and shepherds because there were not enough hands to cultivate the soil on any extensive scale. All of them were adventurers. The capture of the southern territories not only gave the Christians great new areas for pasturage, but it also made possible the wide scale migration of the flocks southward in winter and northward in summer. Thus the occupation of southern Spain was an immediate stimulant for the sheep and wool industry of the entire country. The history of the sheep and wool industry is, in a way, the capsule history of the Spanish economy. Britain and Spain both started out in the Middle Ages as agricultural and sheep-raising countries, but while Britain moved steadily from a pastoral to a textile and hence industrial economy, Spain remained essentially a nation of shepherds. This is not to say that there was never any Spanish textile industry. In the Moslem dominions weaving was one of the most developed aspects of the economy. And in the twelfth century, even in Christian Spain, there was cloth manufacturing in numerous cities. However by the year 1438 this budding textile industry was all but dead. Several things had happened to make this so. First of all Flanders and then Britain, had developed their own textile industries, the latter by prohibiting the export of wool or the entry of cloths into its territories. When Flanders found its looms without a supply of British wool their buyers turned to Spain and began to purchase Spanish wool on a wide scale. The kings of Castile, who were always in desperate need of funds because of the Moorish wars, slapped taxes on the exportation of wool and thus kept themselves provided with funds. Everyone seized the opportunity and began to sell wool. Nobles, monasteries, grandees, and even the inhabitants of the towns could sell their wool to the mills of Flanders at a great profit, and the royal treasury benefited mightily from the various taxes collected on the export of this commodity. Wool profit paid for many of the impressive buildings which were being constructed throughout the land. Unfortunately, this made impossible the early industrialization of Castile, and accentuated the temperament heritage of the Spanish people, who had always had the psychology of wanderers and of shepherds. The ruler of Spain during the first half of the fifteenth century was King John II (1406-1454), father of Isabella the Catholic. He was a weak and cowardly man in his political life, but he had a profound interest in literature and surrounded himself with the best poets writers of his age. “The literary court of John II” has become a set phrase in the history of Spanish culture. Many of these writers were Jewish or Jewish converts. The age of iron had past, the age of gold had not yet arrived, and John II was attempting to transform the iron into gold, that is, turn the Middle Ages into the Renaissance via the process of refined letters. The wars against the Moors had ceased, the epic tensions of another day had temporarily disappeared. Hence was born the cavalier-poet, the writer who could dedicate his pen and life to courtly things and to love. In a way, these poets parallel the more intellectually inclined scholar-writers of the court of Alfonso X, two centuries earlier. But now that Gallego-Portugese school of lyric poetry was dead, Castilian had become the language of literature. The greatest poet of the fifteenth century lived and wrote after the death of John II. This was Jorge Manrique (1440-1479), whose coplas on the Death of his Father are one of the most impressive elegies in any language. Medieval life is coming to a close, but its heroes, the men of action, are remembered in the stirring coplas of Manrique and will be reborn again with renewed dynamism in the Spanish Renaissance.